Looking for ideas on how to find your personal Social Purpose? Follow CertaPro Painters of Huntington Beach franchisee Pat Wade’s lead and identify a cause for which you have a passion, and then see where it takes you. Following the loss of his beloved dog this summer, Pat, a lifelong dog lover, was inspired to make a donation to a local Labrador rescue. Through the rescue group he learned about Race For The Rescues, a 5K run / 1K dog walk and adoption day that raises funds for local animal rescues. Race for the Rescues is sponsored by The Rescue Train a unique, 501(c)3 non-profit, no-kill organization whose mission is to eliminate animal suffering and euthanasia through hands-on rescue work, dedication to spay/neuter, along with education and awareness programs. Funds raised through Race For The Rescues are used to help save the lives of homeless dogs, cats and horses and support their transition to forever homes where they will become cherished family members. Now in its 13th year, Race For The Rescues is its largest annual fundraising event and has raised more than $4 million to help animals in need. 100% of its net proceeds support local animal non-profits. 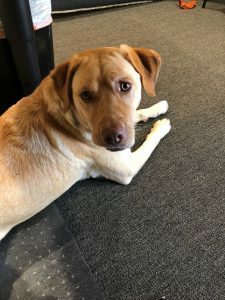 For the 9th straight year, Race For The Rescues has sent its adoption truck back to the shelter empty, with all of the adoptable pets having been placed in loving homes. 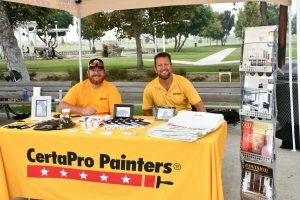 CertaPro Painters of Huntington Beach supported the event through a fundraising effort and a sponsorship that included a booth in the vendor area where the team enjoyed interacting with fellow animal lovers and introducing them to CertaPro’s services. Pat and his family are continuing to #FirstServeOthers through fostering homeless dogs and have just welcomed foster pup Marley Mae into their home – another way they are following their passion and giving back to their community.